Sri Lanka, the five-time Asia Cup Champions suffered a heavy blow as Afghanistan knocked them out of this edition’s Asia Cup. En route to registering their first victory of the tournament, the rising Afghanistan side posted a handsome target of 250 which Sri Lanka failed to chase and ultimately lost by 91 runs. After a disappointing loss in their opening encounter against Bangladesh, they were looking for a much-needed victory against Afghanistan. But unfortunately, the defending champions (ODI format) suffered their second biggest loss (in terms of runs) in Asia Cup history and were forced to their earliest exit in the tournament. The result might have hurt Lankan fans but they were probably aware of the fact that an upset was pretty much on the cards. The Lankans, in fact, have been very poor of late. 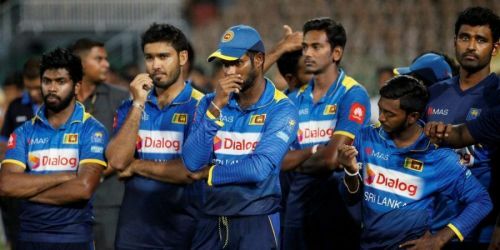 Since 1st January 2016, Sri Lanka has played 60 ODIs where they have won 16, lost 39, 4 have produced no results with 1 game being tied. With a win percentage of just 27% in this period, the lowest among the ODI playing nations, the mighty Lankans will have to improve a lot if they’re to pose a threat in the world cup next year. Since the start of 2016, they have won only 1 bilateral series, that too against newly appointed test playing nation Ireland by 2-0 margin. After that, Sri Lanka has failed to win any of their last 9 bilateral series. Apart from this, Lankans have also suffered 5-0 whitewash three times. To make it worse, they lost their 1st ODI series against Zimbabwe at home. Whilst winning the series 3-2, Zimbabwe became the 1st side to chase 300 plus total in ODI cricket on Sri Lanka’s soil when they chased down the target of 317 at Galle. While their red ball cricket form has been very good with them beating the Test powerhouses South Africa and Pakistan, once an ODI giant, Sri Lanka faces some serious problems in the limited overs format. Has it something to do with a lot of debutants? The fact that 20 players have debuted for Sri Lanka in last 2 years shows how unsettled they are at the moment. In the hindsight, they have been hit hard by some injury concerns as well. Dinesh Chandimal, the skipper of the Test side was ruled out of this Asia Cup with a fractured finger. Similarly, veterans such as Mathews and Malinga also don’t look completely fit and Sri Lanka is yet to fill the holes that Dilshan, Sangakkara, and Jayawardene left at the top of the order. The early exit from the Asia Cup and their recent ODI form raises some very serious questions about their selection and team combination. The selectors and captain Angelo Mathews should take some pretty stern steps in this eight months’ period before the World Cup if they are to come anywhere close to winning the tournament in England. Keeping the long-term discussions at bay, the Lankans need to step up their game next month when they play a 5 match ODI series against England at home.